There are many health benefits of ginger and alleviating forms of travel sickness are included. Have you ever been sea sick? When those Elizabethan sailors discovered ginger would relieve sea sickness it very quickly became an important part of the mariner’s medical supplies. Contemporary studies into the treatment of nausea indicate ginger is effective in preventing vomiting associated with all motion sickness. So if you’re dreading the 5 hour car journey with your travel-sick kids, here’s your solution. Mix a spoonful of powdered ginger into a tumbler of water and settle their stomachs. Many women suffer from "Early Morning Sickness"
Ginger also helps in the early days of pregnancy in which morning sickness can be an inconvenient and troublesome issue. Again recent studies suggest that 1gm of powdered ginger per day is a safe and highly effective solution to pregnancy-related vomiting. It is recommended that this daily intake should be for no more than 4 days. 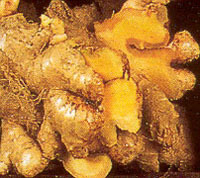 The extract of the ginger root has a history of use in traditional medicine in the reduction of inflammation. Its use brings relief to sufferers from arthritis and colitis. It is felt that Ginger can help lower Cholesterol and prevent blood clots therefore helping those with heart disease. Ginger can relieve indigestion and stomach cramping. Its aphrodisiac qualities are still prized by many. Whether you are using fresh, dried, powdered, preserved, pickled or crystallized Ginger, this spice will provide a warm glow to any meal or beverage in which it’s used.